As of April 5, Johnson & Johnson shares closed at $136.18. The share price has shown fairly steady growth, from ~$70 in 2012 to the current level. The steady share price growth and regular increasing dividend payments have provided solid, stable returns for investors over the past 6 years. This is the only way an investor can realize a return from an investment in shares, through receipt of dividends, and/or gains on sales. 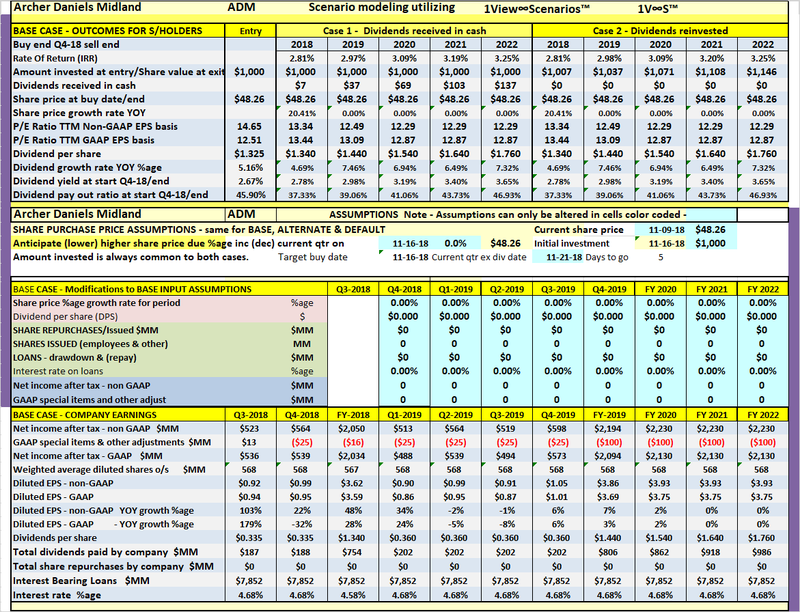 Analysts' Corner proprietary 1View∞Scenarios dashboards are used to assess whether Johnson & Johnson investors can reasonably expect to enjoy returns in the future similar to those available over the past six years. Historical and projected rates of return for Johnson & Johnson are compared to similar data for Pfizer - with Pfizer, perhaps surprisingly, coming out a clear winner. Johnson & Johnson (JNJ) has raised its dividend each year for the last 56 years, making it a Dividend King. Dividend CAGR for 1, 3, 5 and 10 years are all above 6% (see here). Its drug development pipeline has ensured a sustainable business in the past, and should continue to provide a sustainable business into the foreseeable future. JNJ's adjusted non-GAAP earnings have grown by an average 7.6% over the past 6 years. The only way an investor can realize a return from an investment in shares is through receipt of dividends and gains on sales of shares. I repeat - the only way. JNJ share price has grown fairly steadily over the last 6 years, and this is expected to continue on the back of growing earnings. The company has also been growing dividends paid to shareholders, which is the other source of returns for share investors. Shareholders have enjoyed total returns ranging from ~5% to 12% over the past 6 years, as shown in Table 1 below. But that is the past. Analysts' Corner proprietary 1View∞Scenarios™ dashboards are used to assess whether investors in JNJ can reasonably expect to enjoy returns in the future similar to those available over the last six years. Using analysts estimates available through SA Essential and Nasdaq (Zacks research) and company guidance, we find there are good possibilities of total returns ranging from 7% to 10% per year for investors willing to invest and hold through 2021 to 2022 and beyond. Johnson & Johnson and its subsidiaries (the Company) have approximately 135,100 employees worldwide engaged in the research and development, manufacture and sale of a broad range of products in the health care field. Johnson & Johnson is a holding company, which has more than 260 operating companies conducting business in virtually all countries of the world. The Company’s primary focus is products related to human health and well-being. Johnson & Johnson was incorporated in the State of New Jersey in 1887... The Company is organized into three business segments: Consumer, Pharmaceutical and Medical Devices. What I need to do now is undertake the process of determining whether a purchase of JNJ shares at current prevailing prices is likely to provide an acceptable rate of return going forward. This process requires a look at the past and quantification of a range of future expectations for the company. Table 1 below summarizes a sampling of results from investing in JNJ over the last 4-5 years and exiting at the current share price. For many stocks where I create a table similar to Table 1 above, I find a wide range of returns, indicating a degree of volatility and risk. Table 1 above shows the results for JNJ were reasonably positive for 7 different investors, each investing $3,000 over the past 4 years. Average yearly rates of return range from 5.45% for investor F to 11.87% for investor B. These are not just hypothetical results, they are very real results for anyone who purchased shares on the various dates and held through to April 5, 2019. Table 1 shows a fairly steady growth in the JNJ share price over the period under review. This growth in share price was contributed to by a share repurchase program, which I discuss further below. But by far the greatest influence on share price was solid growth in non-GAAP earnings. Past performance is not a guarantee of future performance. Whether now is an opportune time to enter an investment in JNJ shares is examined in detail below. 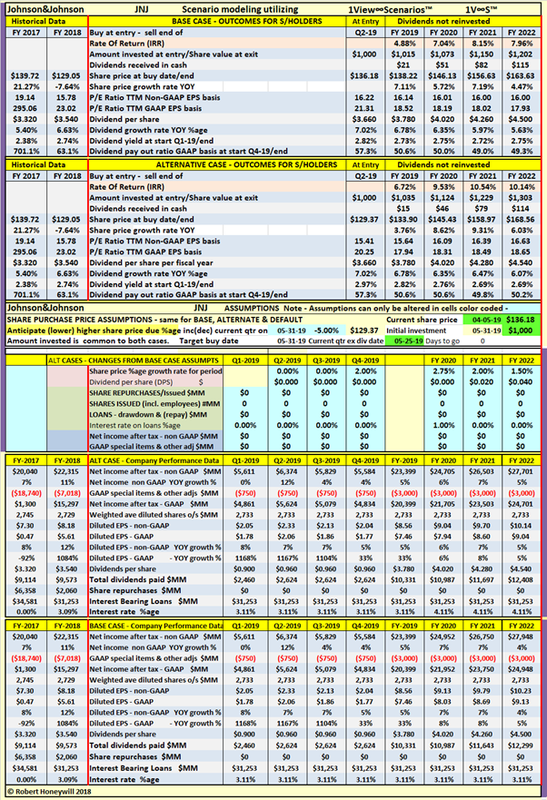 My proprietary dashboards (see further below) allow an investor to project similar data to that contained in Table 1 and conduct an infinite amount of scenario testing to see what returns might be available from an investment in JNJ shares at today's price levels. I believe this quantitative approach is far superior to using Betas, forward P/E ratios, PEG ratios and other indicators to qualitatively review the prospects for an investment in shares. I feed analysts forecasts into my dashboards as part of the process of converting available qualitative data into projected rates of return. The nature of this forecast data leads to analysts' quarterly consensus forecasts not adding up to their full-year consensus forecasts. Some moderation is required, as shown in Table 2 below. Where the analysts' weighted average consensus forecasts do not add to the equivalent full-year EPS, the quarterly EPS is adjusted per the "Adopt" column. The EPS amounts per the "Adopt" column in Table 2 above have been used in the Dashboard Base projections further below. In addition, dividend increases have been input at a rate of $0.06 increase to the quarterly rate effective in the second quarter of each year. 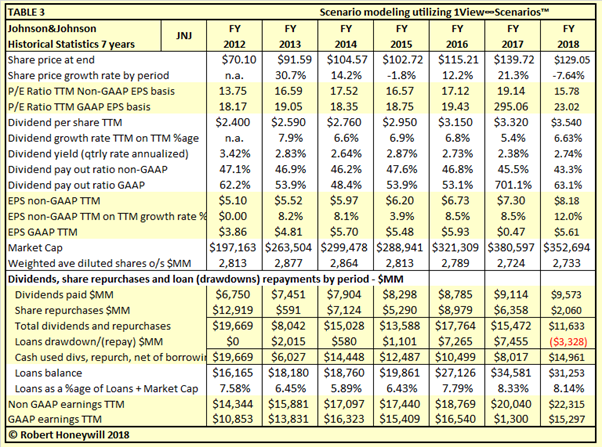 Table 3 below summarizes various historical financial data for JNJ for purposes of comparison when assessing the reasonableness of our dashboard projections. From various data inputs, the historical financial data summary per Table 3 below is auto-generated. The historical summary for JNJ reveals long-term growth in earnings. Non-GAAP earnings in 2018 were a record $22.32 billion, compared to $14.34 billion in 2012. That represents an average growth rate of 7.6% per year over the 6 years. Over the last 7 years to end of 2018, dividend payments total $57.9 billion, and share repurchases $43.3 billion, to give a combined total distribution of $101.2 billion. This $101 billion distribution compares to total non-GAAP earnings of $125.9 billion over the same period. Despite the repurchases, the share count came down by only 80 million, from 2,813 million at the end of 2012 to 2,733 million at the end of 2018. The main reason for this was use of treasury shares to fund acquisitions and, to a lesser degree, employee stock-based compensation. Over the same period, borrowings were increased by $15.1 billion, from $16.2 billion at the end of 2012 to $31.3 billion at the end of 2018. Loans (debt) as a percentage of debt plus equity (market cap) increased slightly from 7.58% at the end of 2012 to 8.14% at the end of 2018. For companies such as Pfizer (PFE) and Johnson & Johnson, I believe it is appropriate to use market cap as the measure of shareholders equity, due to their large investments in R&D. US GAAP requires R&D to be expensed as incurred, but for JNJ and other pharmaceutical companies with drugs in the pipeline, this R&D has significant residual value not reflected in book values. We now are in a position to review the auto-generated projected financial summaries. The first of these is our Table 4 Base projection dashboard which incorporates the projected data included in our input. These dashboards are similar in form and content to Table 3 and include rate of return projections. This Table 4 dashboard is designed to allow us to create and modify a Base forecast by manipulating inputs and seeing the resulting effect on rate of return, share price, P/E ratio and other meaningful statistics. When we believe we have created a suitable Base scenario, we can then move to the Table 5 dashboard, which allows us to interactively vary input and simultaneously see the effect on rate of return and other KPIs compared to the Base forecast. Table 4 dashboard already has inputs for dividend increases and EPS based on analysts' estimates. I am assuming shares will be able to be purchased, on or before May 21, at $136.18, the same as the closing price of April 5. As the estimated second quarter ex-div date is May 25, buying by May 21 will mean eligibility for that dividend payment. I have decided to make adjustments to the P/E ratio before adopting as my Base projection. To do this, I have input percentage increases for the assumptions line item "Share price %age growth rate for period". The effect of these share price increases is to bring the non-GAAP P/E ratio to around 16.0 by the end of FY 2022 and for periods in between. From Table 3, we can see between 2012 and 2018 the non-GAAP P/E ratio at year end was above 16.58 for 5 of the 7 years and only slightly below 16 for one of the remaining 2 years. On this basis, a target P/E ratio of 16.0 is possibly conservative. We can now go to our "Dashboard 2 Base And Alternative Projections" to conduct alternative scenario testing. On or before May 31, 2019, an opportunity arises to purchase shares at $129.37, 5% below the April 5 share price of $136.18. Yearly quarterly dividend increase adjusted upward to maintain the dividend growth rate above 6%. Average interest rate on borrowings increases by 1 percentage point at the beginning of 2020. Non-GAAP P/E ratio increases to 16.63 through end of 2022. This is the average of year-end non-GAAP P/E ratios for the 7 years from 2012 to 2018. The effect of all of the above is to increase the projected rate of return through end 2021 and 2022 by ~2-2.5 percentage points, from ~7-8% per year for the base case to ~9.5-10% per year for the alternative scenario. Of course, it is possible to construct an infinite number of scenarios by varying assumptions and instantaneously seeing the impact on dividends, dividend yield, and total rate of return. To limit the amount of information on the dashboard, I have not included a "dividends reinvested" case. But I can assure all those DGI investors who follow Seeking Alpha that the working model, available at Analysts' Corner, does provide results for the "dividends reinvested" case. JNJ's earnings growth prospects look solid, based on the company's history over the past 8 years. But as I am fond of saying, the only way an investor can realize a return from an investment in shares is through receipt of dividends and/or gains on sales. I repeat - the only way. JNJ has delivered in that regard, as can be seen from the historical results for investors per Table 1 above. Tables 4 and 5 above suggest that JNJ is likely to continue to deliver similar results into the future. The investment opportunity can be improved by buying, if and when the share price dips, with a fair degree of certainty the share price will reach higher levels in the future. The other advantage of buying at a low share price is more shares are received for a similar amount invested. More shares means more dividends and a higher dividend yield. 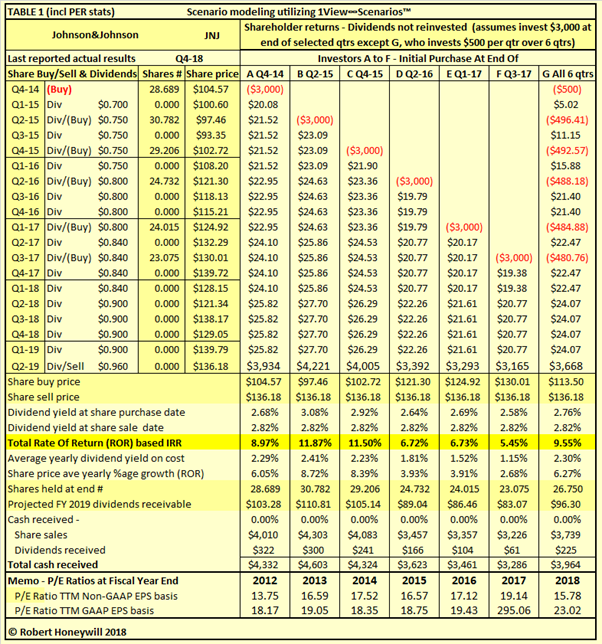 It is possible to do further scenario testing using Dashboard 2 to see what buy price for JNJ would meet your individual target return objectives. That does not mean the share price will come down to a lower price. But it will position you to be able to act quickly if the share price does come down. One thing that is for sure is that this company has been around and paying increased dividends for a very long time. That is unlikely to change. But for an investor in JNJ shares, a significant determinant of likely return on investment is the entry price paid for shares. It is only by projecting the future possibilities that we can get an idea of what current JNJ share price level would represent a suitable entry point. Different investors will have different ROR expectations. Use of dashboards like those pictured above enables any investor to see whether JNJ represents a buying opportunity for them at the current share price, and if not, at what share price it might be of interest. If there is concern about the effect of higher interest rates than those projected above, the effect can be easily seen with one or two simple inputs to the Base/Alternative scenario dashboard. 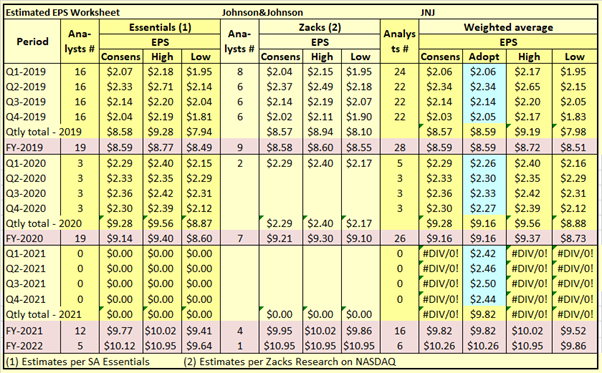 In Table 6 below, I compare historical returns for JNJ with similar historical returns for Pfizer. See my Pfizer article already published on Seeking Alpha. Surprisingly, over the last 4-5 years, Pfizer has provided superior returns to JNJ in 6 of the 7 cases in Table 6. How Can Pfizer, With Flat Earnings Growth, Convincingly Outperform Johnson & Johnson? As noted under Table 3, Johnson & Johnson has grown adjusted non-GAAP earnings at an average rate of 7.6% per year over the 6 years to the end of 2018. Over the same period, Pfizer grew adjusted non-GAAP earnings at an average of just 2.2% per year. For the 7 years from 2012 to 2019, JNJ generated non-GAAP earnings of $125.9 billion, compared to $108.1 billion for Pfizer. But on a GAAP basis, over the 7 years, JNJ earnings were only $89.6 billion, $2.7 billion lower than Pfizer's earnings of $92.3 billion. Adjusted non-GAAP earnings can be useful to separate out unusual ("special") and not necessarily recurring items as a basis for projecting future profits. However, with companies like JNJ and Pfizer, there are always "special" items in one form of another that crop up year after year. These "special" items represent real expenses that come out of shareholders' funds. In the 7 years from 2012 to 2018, JNJ's "special" items totaled $36.3 billion, $20.5 billion more than the $15.8 billion for Pfizer. I have written previously on the need to consider "special" items, in my 2013 article, "Johnson & Johnson: When Special Items Are The Norm", and in my 2015 article, "Johnson & Johnson: No Real Earnings Growth Since 2007; And Don't Ignore Special Items". The other factor improving returns for Pfizer versus JNJ was Pfizer invested in itself through share repurchases, improving EPS despite flat earnings. JNJ also repurchased shares, but reissued a large portion for funding acquisitions. The company also increased borrowings for acquisitions. It was investment in acquisitions that allowed JNJ to grow earnings at a faster rate than Pfizer, whereas Pfizer grew EPS by reinvesting in itself through share repurchases. It would seem Pfizer's strategy has been superior to JNJ's strategy. Will Pfizer Continue To Convincingly Outperform Johnson & Johnson In The Future? 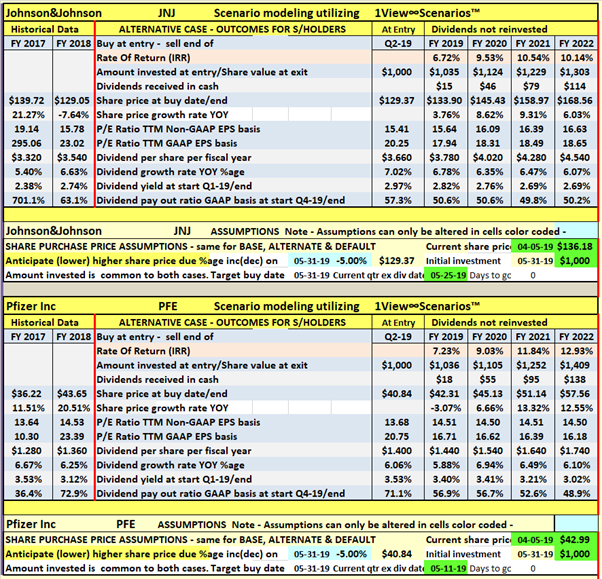 In Table 7 below, I compare projections for JNJ with similar projections for Pfizer. See the Pfizer article already published on Seeking Alpha and linked above. As an investment choice between JNJ and PFE, Table 6 indicates PFE is a clear winner. The reasons the company is projected to be a clear winner are the same reasons it has been a winner historically, as described above. For both JNJ and PFE, it is assumed shares are bought at 5% below the closing share price on April 5, 2019. 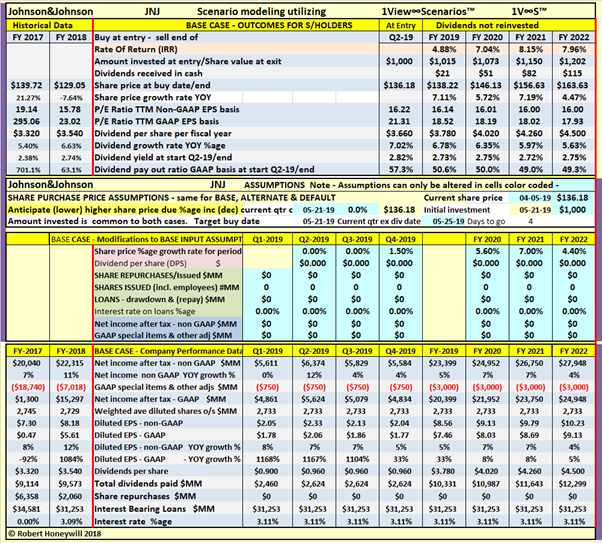 It is further assumed JNJ will have higher non-GAAP P/E ratios at the end of 2021 (16.39) and 2022 (16.63), versus PFE's 2021 (14.51) and 2022 (14.50) based on historical averages. PFE is projected to provide average total yearly return through the end of 2021 and the end of 2022 of 11.84% and 12.93% respectively, compared to 10.54% and 10.14% respectively for JNJ. Projections show similar dividend growth rates for PFE and JNJ, but higher dividend yields and higher total dividend receipts for PFE compared to JNJ. PFE's dividend payout ratios for 2021 and 2022 are projected to be 52.6% and 48.9% respectively, compared to 49.8% and 50.2% respectively for JNJ. Based on the assumptions described above, an investment in PFE will likely provide higher dividend yield and higher total returns than for JNJ. Tables 6 and 7 allow a potential buyer of JNJ or PFE shares to compare what matters most: projected average yearly returns on investment, as well as dividend yield. After all, the theory of stock valuations is to take a risk-free rate of return from government bonds and add on a risk premium to arrive at an expected or targeted rate of return. Rate of return is the one common basis of comparing investments. There is qualitative data available in the form of EPS estimates, forward P/E ratios, PEG ratios and so on. But these do not allow easy comparison between two stocks, as exemplified by the above comparison of JNJ with Pfizer. By using 1View∞Scenarios™ models at Analysts' Corner, we are able to process these various estimates into quantifiable projected rates of return, providing a single valid comparator.